The process of cleavage is the step of embryogenesis where the zygote divides to produce a cluster of cells known as the morula. 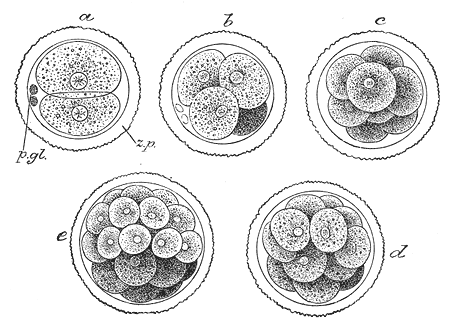 Following fertilization a series of rapid cell divisions occur that decrease the cells’ size with each subsequent division—this eventually produces a morula. The different cells derived from cleavage, up to the blastula stage, are called blastomeres. For species such as humans, there is little yolk in eggs, and the divisions are relatively symmetrical, or holoblastic. For other species, such as birds and reptiles, the presence of yolk dictates uneven meroblastic divisions that produce cells of uneven size and distribution. The end of cleavage is known as the midblastula transition and coincides with the onset of zygotic transcription. The cells of the morula are at first closely aggregated, but quickly become arranged into an outer or peripheral layer, the trophoblast, which does not contribute to the formation of the embryo proper, and an inner cell mass from which the embryo develops. cleavage: In embryology, this is the division of cells in the early embryo. trophoblast: The membrane of cells that forms the wall of a blastocyst during early pregnancy and provides nutrients to the embryo, and later develops into part of the placenta. morula: A spherical mass of blastomeres that forms following the splitting of a zygote; it becomes the blastula. Cell division with no significant growth that produces a cluster of cells that is the same size as the original zygote, is called cleavage. At least four initial cell divisions occur, resulting in a dense ball of at least sixteen cells called the morula. The different cells derived from cleavage up to the blastula stage are called blastomeres. Depending mostly on the amount of yolk in the egg, the cleavage can be holoblastic (total) or meroblastic (partial). Cell cleavage: Early development is characterized by cleavage of the zygote, which refers to cell divisions that are not associated with significant growth of the embryo. Holoblastic cleavage occurs in animals with little yolk in their eggs. These species, such as humans and other mammals, receive nourishment as embryos from the mother via the placenta or milk after birth. On the other hand, meroblastic cleavage occurs in animals whose eggs have more yolk, such as birds and oviparous reptiles (although some viviparous reptiles also exist). Since cleavage is impeded by the vegetal pole, there is a very uneven distribution and size of cells. Cells are more numerous and smaller at the animal pole of the zygote than at the vegetal pole. In holoblastic eggs, the first cleavage always occurs along the vegetal–animal axis of the egg, and the second cleavage is perpendicular to the first. From here, the spatial arrangement of blastomeres can follow various patterns, due to different planes of cleavage in various organisms.The end of cleavage is known as the midblastula transition and coincides with the onset of zygotic transcription. In amniotes, the cells of the morula are at first closely aggregated. However, they quickly become arranged into an outer or peripheral layer, the trophoblast, and an inner cell mass. The trophoblast does not contribute to the formation of the embryo proper; the embryo develops from the inner cell mass. Fluid collects between the trophoblast and the greater part of the inner cell mass, and thus the morula, is converted into the blastodermic vesicle (also called the blastocyst or blastula). The inner cell mass remains in contact with the trophoblast at one pole of the ovum. This is named the embryonic pole, since it indicates the location where the future embryo will develop. In the case of monozygotic twins (derived from one zygote), a zygote divides into two separate cells (embryos) at the first cleavage division. Monozygotic twins can also develop from two inner cell masses. A rare occurrence is the division of a single inner cells mass giving rise to twins. However, if one inner cell mass divides incompletely, the result is conjoined twins. Dizygotic twins is the development of two embryos from two different zygotes.